Many people wait for too many things. They wait until, “I’m skinny… have more money… more time, more….” everything. I have learned to not wait, anymore. Go and do! Take an hour and do something that you want. I understand that there are other things that need to be factored in, but take an hour to get your nails done, go out for coffee, or see an old friend. If there is something that you want to do, learn or see, do it! Go for a walk. Go for a bike ride. I used to go to work and go home. I gained a lot of weight sitting on the couch. Then, I discovered bellydance and lost a lot of weight, because I was doing something. I don’t weight anymore. 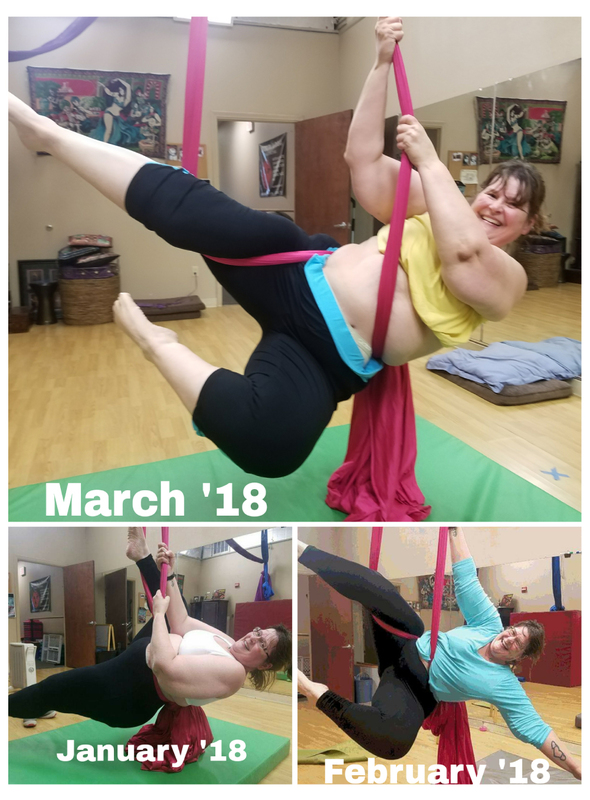 I have been doing silks for the last three months. I am doing 30 minutes at a time two to three days per week. What have I learned? That it hasn’t gotten easier. I have gotten stronger because I am not weighting anymore. It is true, I have struggled, but I stayed and fought. I earned it! I made my decision to try, and what I gained is so much more than strength or a rockin’ body. I gained self-confidence and more self-esteem. In this world of Instagram and SnapChat, we need to slow down. Take the time to learn, work, and struggle. We should do whatever we want to. It doesn’t matter if we are short, tall, fluffier, or skinner. Don’t give up because it is hard. Try harder. Fight for it. Refuse to let others bring you down. Never be afraid of falling because it means you tried. After you fall, the only way is up! I want people to see that anyone, who wants it bad enough, can do this. Yes, it will be a struggle. It will be difficult. It will be worth it. Theresa discovered ArtFit by accident when she saw a belly dance performance by Cheryl and the ArtFit troupe at a local fundraiser. 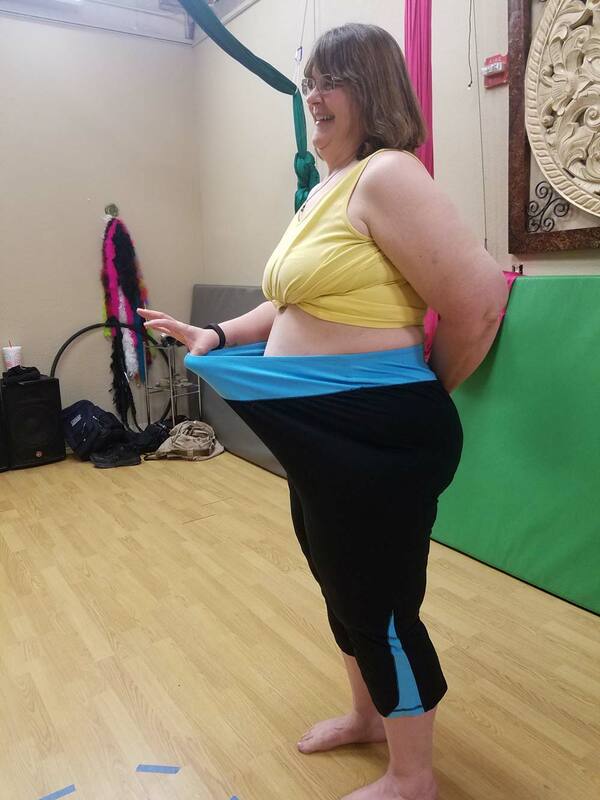 She began classes after signing up for a version of the “Biggest Loser” at her work. Going into this competition, she knew that she had to find a workout program that was more motivating than going to a gym. She participated in her first belly dance class in March of 2006. There was no turning back! She was hooked! She has been studying under Cheryl for the last 11 years learning, perfecting, and performing. She can be seen regularly performing as a soloist and troupe member. Theresa has completed Teacher Training and a mentorship with Cheryl. Through her mentorship, she has found her own personal style of dance and her personal style of teaching as well. 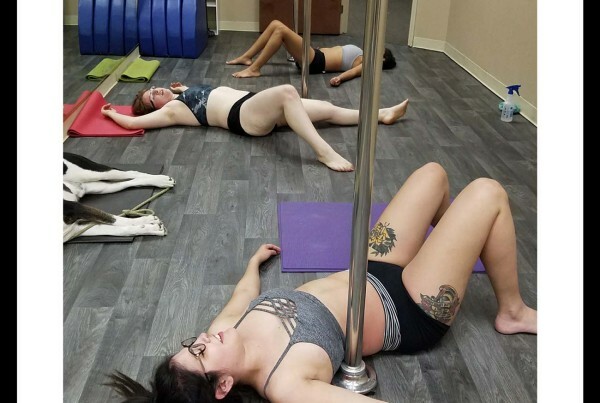 She regularly teaches the beginner belly dance class for women with “curves and all”. She also is a substitute for the intermediate and advanced level belly dance classes and helps out where ever she is needed.